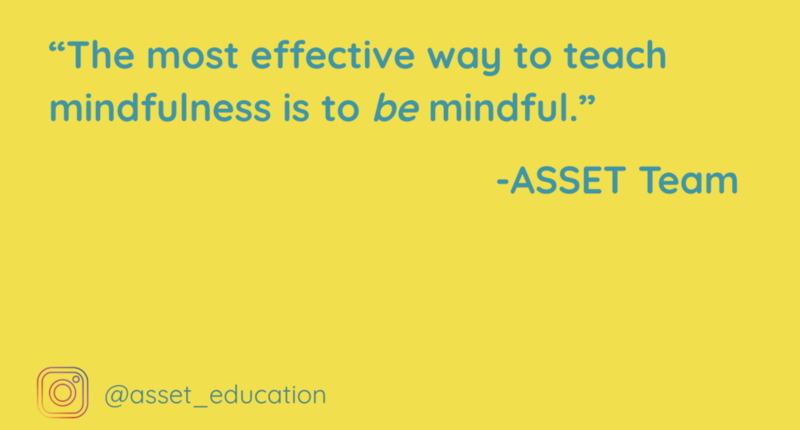 The most effective way to teach mindfulness is to be mindful. Before you facilitate an ASSET tool, take a few deep breaths. Soften and slow down your speech. Feel yourself in your body. Notice your surroundings. In other words, practice mindfulness! You’ll be better able to guide your students through the tools and respond to questions they may have. We truly don't see any more effective way to teach mindfulness than modeling being mindful. By embodying the practice, you are increasing the odds that students buy-in. Students will see that mindfulness is something that their teacher values by watching how you approach and engage with mindfulness tools. This is key for effective implementation in the classroom. Gina has taught high school English for nearly a decade and recently discovered the power of social & emotional learning after embedding ASSET into her classroom culture. She now serves as ASSET’s Director of Programs and brings a teacher’s perspective to curricular and professional development materials. In her free time (when her bouncing baby boy is sleeping or in someone else’s arms), Gina loves to read, cook big family dinners, and get outside with her husband and dog.